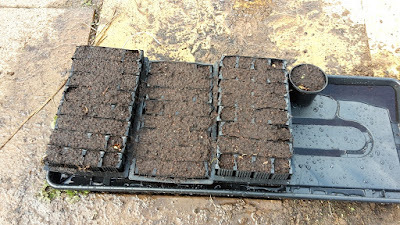 I've posted before about dividing up comfrey and using root cuttings to make new plants and the other night I decided to make another huge number of plants with one purpose in mind. 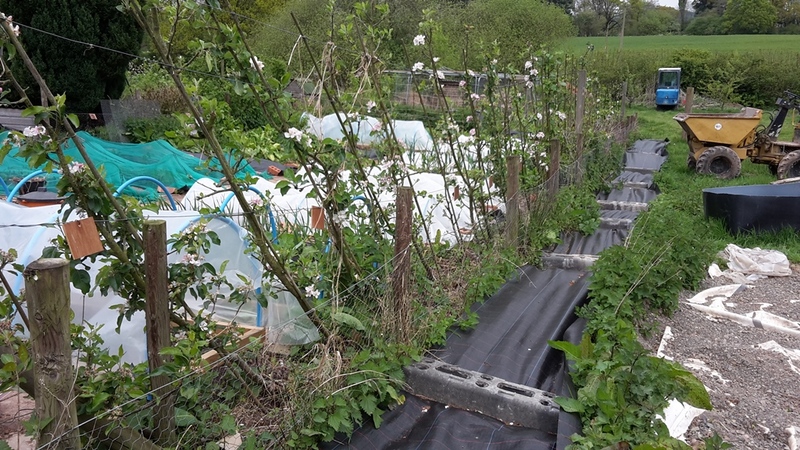 Plastic down to suppress weeds. 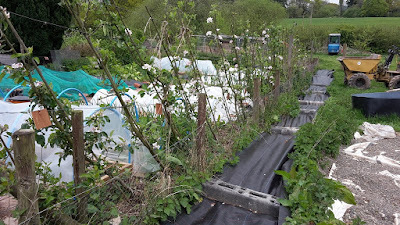 The idea is to grow a 4ft strip of comfrey (boking 14) down the side of my garden to create a "weed barrier". The idea being that if these plants are established it'll leave far less room for other plants to take hold (like the nettles that are there now), I'll also under sow the plants with clover as a ground cover. 98 root cuttings to make some more plants. I'm not sure how well this idea will work but it seems like a good idea on the surface. It should stop the buttercups creeping their way back in and with the plastic cover this summer it should get rid of the nettles. 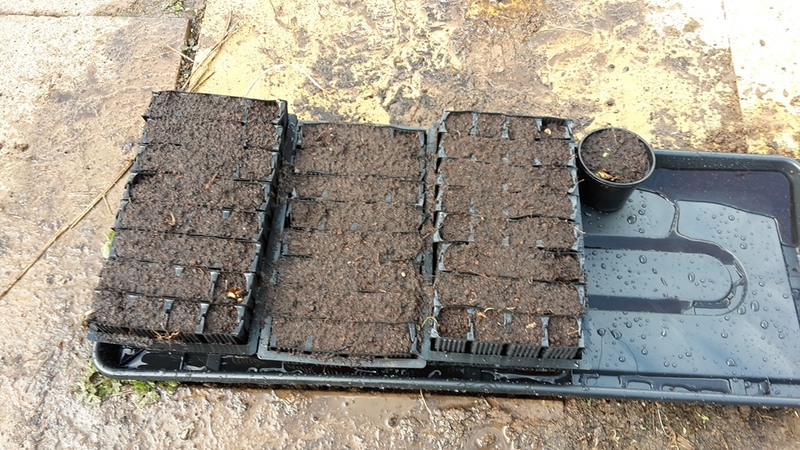 On top of this I'll be growing a hugely beneficial plant right next to where I need it, I can use it as a mulch, a plant food or to go in the bottom of trenches to grow beans on top of. I wanted more comfrey plants and this seems like a good area to plant them. Will it work as a weed barrier? Kev - i don't know if it will act as a weed barrier but from everything i have read/learned about comfrey it should do the trick. in addition - comfrey is one of the best fertilizers in the world - besides seaweed. you can take cuttings from your plants all season and make comfrey tea. you can also use big comfrey leaves to lay between rows of veg - they act as a weed barrier and provide nutrients to the veg as comfrey breaks down really fast and is full of nutrients! keep us updated as to how your plan unfolds! I love it as a fertiliser, I make so much plant food from it, but as the garden gets bigger every year so does my need for more of it! Hackers who scam has been a serious concern to the cyber service users like us!!. Am SCOTCH Ferdinand a woman with desperate desire of hiring a legit hacker which got me into falling victim of many rippers. I finally went through a website called quora (a very popular site where questions are been raised up as topics for answers). I scrolled and saw a man named COREY RODRIGUEZ answered to a question which really got to me. Which was how I got help.! I am no help on this, but I did notice you said you had nettles---a sign of GOOD soil. Congrats. Make tea with it! I make tea with it but for the amount I have growing here I'd need to brew it in a swimming pool! It is good soil here so I'm lucky that way, takes very little improving really. Don't know about being a wed control but wilted comfrey leaves are great to attract slugs and I'm guessing you don't want those. i run the chickens through the garden in the winter and that helps keep numbers down and the free ranged hens will have access to the strip of comfrey, I'll have to see how it goes. Interesting idea! I'm curious to see how this turns out. It's difficult for me to prevent weeds along the fence line of the vegetable garden and is been thinking of some kind of dense plant barrier but all I could come up with is dalhias. I've also thought about sorrel under my apple trees that form the barrier at the moment, anything other than nettles! It'll work as a weed barrier, but beware, it's very rampant and you'll spent half your time trying to get it out again! As a gardener in a previous life, the voice of experience talking here! Personally I'd stick with a membrane of some sort. Hopefully not as it is Boking 14 so it shouldn't spread too far. Worst comes to worst I can cover ti over for 12 months and start again I guess! Buttercups used to be the worse, the first couple of years they were terrible but now nettles have the top billing with docks running a close second and reeds following a close third place! Can you come HACK down some weeds growing in the communal garden? Yeah and some of my weeds please! its great stuff, but I agree with Sue, it can be invasive. Do not let it seed! The seed is sterile in Boking 14 so I hope it won't spread anymore than where I plant it really. Time will tell but I won't let it go to seed anyway, it'll be chopped down and used before then! I hope it works! It's a great idea. I'm hoping my comfrey does better this year; I have the same strain but it really doesn't seem to like our hot summers. I'm sure they're a comfrey strain that is better suited to drought conditions I'll have to look it up. I've always thought of it as a weed. Although it will cover up areas contaminated by fuel spillage like around former fuel pumps on farms. The normal comfrey is but this one won't srpead (hopefully) good use of it around the fuel spill areas, although not sure I'd want to make my fertiliser out of those plants! Good thing you want it to grow everywhere because that is what perennial herbs do!! I have Lemon Balm, Comfrey, Thyme, Fennel & Peppermint taking over the back corner of my property!!! I planted it as a Butterfly & Bee garden years ago with wildflowers & it's grown all along the fence & drive. I love the smell & mix of herbs!! The neighbors hate me. Beware - once it's in there, nothing less that a wildfire followed by a flood, will take it out!! I love my fennel popping up everywhere but somehow I lost my lemon balm and thyme never does that well here unless it's in a pot. Like I've said I hope it won't spread as it's seeds are sterile but everyone's comments are making me a little worried now - all I can do is try and hope for the best! I think you'll be fine with Boking 14, it's the non-sterile varieties that have given comfrey it's fearsome reputation. I had Boking 14 in my old house and dug it out to bring with me. I definitely (accidentally) left some bits of root in and where I grew it is now lawn. With regular mowing it appears to have gone, so like you said, if you change your mind just cover it up. I said on face book, I'm doing the same thing along the fenceline we share with a field because nothing else stops the weeds from getting in. Some neighbours have dwarf comfrey along their fence and that's certainly done the trick. dwarf comfrey is no good as plant food though- the leaves are too low in potassium I think. Presumably no long tap root. Thanks Hazel, I think you're right, worse case I can cover it over again. To be honest I might propagate another 100 plants if I get chance this week, I already have another area marked out for them, such a useful plant and one I wouldn't want to be without. believe his eyes when he saw the evidence because he had no idea he was hacked..